Cranmer Country Cottages01328 823135work01328 823136fax Self-cateringCranmer Country Cottages is a small privately owned and managed luxury holiday complex featuring an indoor heated swimming pool and tennis courts. On our main site we offer a cluster of eight 4 & 5 star cottages sleeping from 2 - 6. The properties are homely yet stylishly converted barns with a neighbouring dog friendly cottage annexe. The family friendly cottages are set within 170 acres of sweeping farmland and gardens just a few minutes' drive from many of the best beaches and sophisticated market towns of the North Norfolk coast. Cranmer Country Cottages offers weekly bookings starting on Friday and short breaks of 3 days starting on Friday and of 4 days starting on Monday in some seasons. 2 bedrooms, ground floor accommodation suitable for families Bath with over bath shower. Communicates with Owl to sleep up to 8. Price includes heating, washing, bedding & towels for use in the cottages. It does not include use of the games packs or pool key hire,bedding for cots, tumble drying or subsequent bags of logs. Wagtail offers weekly bookings starting on Friday. Woodpecker offers weekly bookings starting on Friday. Cranmer Country Cottages is a small privately owned and managed luxury holiday complex featuring an indoor heated swimming pool and tennis courts. On our main site we offer a cluster of eight 4 & 5 star cottages sleeping from 2 - 6. The properties are homely yet stylishly converted barns with a neighbouring dog friendly cottage annexe. The family friendly cottages are set within 170 acres of sweeping farmland and gardens just a few minutes' drive from many of the best beaches and sophisticated market towns of the North Norfolk coast. Cycle storage available. 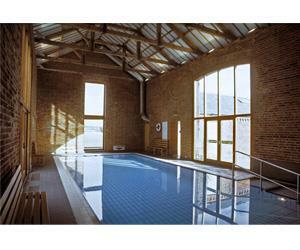 Indoor heated salt dosed swimming pool open all year. 2 all weather tennis courts. Games room. Outdoor play area with wendy house. Children welcome from any age. From A148 from Fakenham take A148 towards King's Lynn. After 0.25 miles take right turn. B1335 towards Burnham Market. After 2 miles take left fork signposted Dunton. Home Farm is 0.25 miles on right. From King's Lynn - 25 miles. A148 direction Fakenham. From Norwich - 29 miles - A1067 direction Fakenham. We cannot guarantee to have staff available in an emergency on site 24/7. Buildings are soft red brick victorian converted dairy barns. We are happy to talk through any special requirements and advise if we feel any of our properties are suitable for people with specific special requirements.